Neltex Waterline System is your complete and dependable in-house water piping system for 6 storeys and below. Neltex Saniguard 8055 are impact modified drain, waste, and vent pipes and fittings for both above and underground (inside building) piping installations. Saniguard Pipes and Fittings conform to (and even exceed) ASTM D2729 and ASTM D3311 standards, respectively. Powerguard 8055, Neltex’s premium quality electrical conduit, is made with 90 % K65 Grade Resin for above standard quality and durability. Neltex Powerguard product line also includes PVC conduit pipes, fittings, electrical boxes and connectors all brilliantly designed for safe and efficient electrical systems. Neltex Saniguard 8055 Pipes have a unique PVC DNA making it the toughest in its class (80 Joules Izod Impact and 55 MPa Tensile strength). 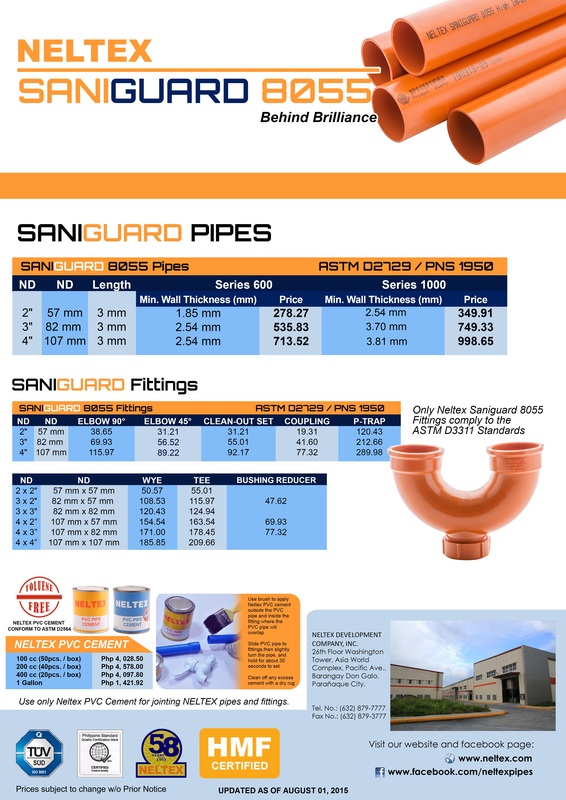 All Saniguard 8055 pipes are made with 90% K65 grade virgin PVC resin. This guarantees that GUARD DWV Pipes can last not only the design life of your building; it can also withstand the rough and tumble of the jobsite. With Neltex’s commitment to uncompromising quality, all sanitary pipes produced at Neltex’s lead-free plant in First Cavite Industrial Estate (FCIE), Cavite are inspected and tested in conformance to ASTM D2729 Standard Specification. Moreover, Neltex Saniguard 8055 Pipes are designed to be brilliantly tough such that Saniguard S600 can withstand S1000 standards. This unique GUARD DWV feature allows Developers & Contractors to save up to 25%. This unique product benefit of the Saniguard 8055 was showcased in the NELTEX HATAW CHALLENGE as witnessed by more than 5,000 PALO-ers. Guard DWV Fittings are the only PVC Sanitary Fitting System that is injection molded out of K65 PVC Resin. While most sanitary fittings in the market are made with lower grade PVC resin, Neltex uses the same impact modified formulation used for its pipes on its fittings. This means that whenever you use Saniguard 8055 Pipes and Fittings, you can be sure of brilliance and system integrity throughout your drain, waste, and vent system as the PVC Fittings are made from the same materials that the PVC Pipes are made of. In addition, Only GUARD DWV Fittings conform to ASTM 3311. Neltex’s sanitary fittings each have the right sweep slopes and bends to ensure transport accuracy and smooth waste water flow. To get the full benefit of having a world class DWV Pipe System, specify only GUARD DWV Pipes & Fittings. Copyright © 2014 Neltex. All Rights Reserved.